I work from home using my computer. I also go into the office a few days a week now. I come home and finish my work on my computer. Then I started to blog, I post and read a lot. I have found some new creative juice to draw from. Then. The keys on my laptop started wearing off. The R turned into a P, the F is an upside-down L and the N & D all but disappeared. Then. The other day, I walked away from my computer, a word document was open. To be honest I didn't just walk away, I went to the office, I was gone for 3 hours. When I got home, I sat down to 26 pages of the bracket symbol! 26 pages and still going! My keyboard was the Energizer Bunny of Computers! Yup. It's no longer attached. Is there a gremlin in my house? Adam likes to take off all of my buttons... needless to say, daddy doesn't find it a fun activity to put them all back on... oh well. haha. My letters are rubbing off, too. Too funny. Wonderful! I came here from MamaGeek's site and I'm so glad I did. 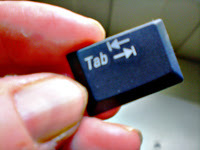 Looks like you're keeping ``tabs'' on the problem!! I bet its a Dell computer .. they have the WORST keyboards (and customer service) in the world .. however I loved your post .. David sent me and I am glad he did~! Haha! I'm betting that little gremlin answers to Harrison! LOL. Yeah, I guess that is a bit of a problem!! Oopsie! Getting a bit of use, is it?